There is a reason why Heijunka is a block in the foundation of the Toyota House, or the Lean House as some call it. The short answer is stability in an operation. The rest of this article will show Heijunka Examples, then discuss what can go wrong without it. I’ll also share 4 Videos that further explain how to apply Heijunka and share several Heijunka Boards as example. The Toyota House, or the TPS House, is a great metaphor for the Toyota Production System. The TPS House is based on the idea that “A House Divided Cannot Stand”, Citing the great Abraham Lincoln, who is quoting from the Bible. This means that every part of the house has a role and has a specific purpose. The foundation of the house is critical. A block in that foundation is Heijunka. Heijunka is a Japanese term to describe “production leveling”. The distinction between “leveling demand” and “production leveling” is important because we cannot control demand. What we can control is the rate of workload – information, material, raw good, finished goods in fulfillment, or actual production – enters the operation. Notice that the forecast requirements are met with 11 A widgets, 9 B Widgets, and 7 C widgets. This is classic batch production. In this example, the company forecasts that their orders will mostly be A, then B, and then C will probably have the least number of orders, which is why there are much fewer C production hours. Suppose there’s a big spike in C widgets on Tuesday. This means the customer has to wait until Friday for the order to be fulfilled. Suppose the firm decides that the customer shouldn’t have to wait, then the production schedule is changed and an expedited order is created. This creates an overburden on the employee, overtime pay, and instability in the system. Suppose the expected demand for C falls, then we end up with more C widgets than the customer needed – overproduction. Suppose we find a defect in production for A widgets on hour 5. This means we’ve produced 4 hours of defective products. In this example, the forecast requirements are again satisfied. Notice how the production schedule of A, B, C is dispersed throughout the week. This approach creates a stable and predictable production schedule, less burden on the employee, fewer instances of overproduction, and the ability to fulfill demand during times of uncertain customer demand. We’ve seen from the non-heijunka example above that there are several wastes that come from a non-level production environment. If what I say is true, then much of continuous improvement will be limited if there is no level production. In fact, in that environment most of the mental and physical energy is trying to figure out what is going on. Heijunka is a critical foundation of any application of Lean. One challenge of Heijunka is in its application. Depending on the industry and business you are in, the application will generally need to adjust. But the principle remains the same – to level production, create stability and predictability. But to implement Heijunka, we need to first learn a little bit about the Pacemaker Process. To implement Heijunka, it’s important that you identify the Pacemaker process. Pacemaker is a misnomer in many ways because it doesn’t quite work like the Pacemaker you might find to help someone’s heart beat. The better metaphor for the Pacemaker Process might be that of a conductor of an orchestra. This metaphor works because that’s exactly what we want to the aspire to and identifying the Pacemaker Process is critical to the success of any Heijunka implementation. Because Heijunka should be strategically placed at the Pacemaker process. Below is a 31 minute video that further explain Heijunka and shows how to implement it. Hey guys and welcome to the heijunka section of the stability series. Now in this section we’ll be covering leveling, a basic heijunka calculation, as well as the basics of single-minute exchange of dies. But before we get started, I want to give you a little illustration about heijunka. Now, mura is the Japanese term for unevenness. Now, if you go to a grocery store, you’ll notice that certain lines have more people in line than others. That is a form of mura. 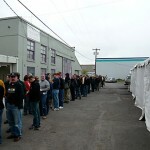 You’ll also notice that depending upon the time of day lines will be longer and shorter. Again, that’s a form of unevenness. So in a recent trip to Walmart, I noticed how they were attacking mura. They have a digital board that tells the customer which line to go to. So once the cashier clears the customer, a button is pushed and then the digital board lights up with that particular cash register’s number. The next customer proceeds to that cash register. This is a way of evening lines and fighting mura. So while I was at Walmart I was leafing through a Cosmo magazine and I came across the mura diet. Conventional knowledge tells us that we should have five to seven servings of breads and grains, four servings of vegetables, two to three servings of meats, and eat fats and oils sparingly. The mura diet follows the same principle but over erratic periods and quantities. So whereas the food pyramid recommends these foods daily, the mura diet recommends that I eat all meats for two weeks, then switch to grains and breads for eight weeks, and then to vegetables for one month, and then I can reward myself by eating pure lard for three weeks. I decided to give it a shot and after a solid four months of the mura diet, I began noticing my body changing. It seems no matter how active I stayed, the pounds just kept piling on. This is me just six months after the video footage you just saw at Walmart. 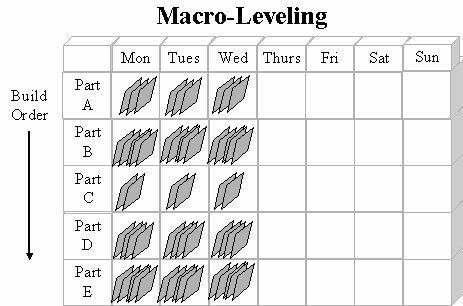 How about a more leveled approach? Perhaps the old food pyramid made sense after all. A heijunka or leveled approach with balanced meals, meals with all food groups represented, eating frequently throughout the day and in small predictable quantities would help me once again look like a Greek god. Now, this illustration about the mura diet may seem silly, but this is often how we treat our external customers by batching their orders. Now, this is how we can use leveling to help our internal workforce. Remember the paper airplane exercise? If you’ll recall, worker four had way too much to do with four folds while worker one had only one fold. The resulting system produced 57 pieces of WIP [SP]. We can redistribute work and level-load the line to look like this. This is another way we can use heijunka to fight mura in our internal processes. If you’ll recall from our waste series, mura is the waste of unevenness. Now, we use heijunka to combat mura. Now, what do I mean by “unevenness”? We know that customers both external and internal can be erratic at times. So we try to create an environment with even level pull so the customer can pull what’s needed in a calm, even manner. We try to pace the timing in which we replace those items that have just been pulled, and then we try to sequence the items in which we’re replacing in a calm, even manner. So this is what I mean by level pull. If you recall from our inventory section, the customer is given the option of taking any color plane from finished goods. We create a pull friendly environment by giving the customer the option to pull what is needed so he doesn’t feel compelled to hoard. Whatever is taken, the system reacts in a calm, level manner to replace those goods that were pulled. Now, this is what I mean by level pacing. This system could be very volatile if we replaced the pace and production to react to short-term changes. Level pacing teaches us that short-term changes in pace at which the customers pull are generally noise. And a sustained calm and level pace producing the takt time is what is actually needed for long-term stability. Finally, level sequence means we attempt to balance the sequence in which we replenish what has to be produced. So obviously customers don’t consume all of one product, green squares for example, then all red triangles. So why do we produce this way? Using the level sequence, we mix the order in which we produce to align better with how the customers consume products. Now, traditionally, efficiency was measured in high machine utilization. Now, when set-up times were 24 hours or more, it just made financial sense to spread the cost of that set-up across a large batch of items. Now, set-up times have since dropped, but people still keep that mentality. So they use machine utilization and they try to hide set-up across a large batch of items. So you can see here, the bar represents the total material, labor, and set-up costs for producing a single item in a batch. Obviously, the set-up cost is very high and it would be wasteful to produce only one unit with such high set-up costs. So this is what our cost would look like if we produced five units after setting up. Notice the per unit cost has gone down. Now imagine if we produced 25 units. You could see how one could easily fall into the trap of maximizing batches to hide set-up costs. Now, you can see the relationship between set-up and batch size. Now, what some people try to do to minimize their set-up is to maximize their batch size. That’s one approach. But the alternative is to minimize the set-up time and then minimize the batch size to correspond to that smaller set-up time. So here’s our original diagram again. Now, if we apply set-up reduction you can see the impact it has to the total cost model per unit. Once we reach this state, we’re free to produce as many or as few units as we wish because it costs just about the same to produce one unit, five units, or 25 units. At this state, producing in smaller lots is to our advantage. This is what I mean by scaling your batch size to your set-up time. One of the biggest benefits to heijunka is the reduction in lead time. So this is what the lineup would look like without heijunka, and this is what it looks like with heijunka. So if I was waiting to receive a blue unit, I would have to wait until the end of the production run. See how long this takes? Now, if the lineup was level, this is how long I would have to wait for a blue unit, only a fraction of the time. Now, another benefit is the reduction in liability when producing a defect. In my traditional model, let’s assume I got a blue unit and I found out it was defective. I ‘d call the factory and they’d most likely find that all the blue units in that production run were defective. Now, they need to produce an entire lot of blue units to replace these defects. Now, in the heijunka model the same blue unit could be defective, but only one was produced in the production run so it costs the company a lot less to replace it. A benefit related to defect liability is flexibility. In our original scenario, if one defective blue unit revealed that the entire batch of blue units was defective, then the producer has very limited flexibility to rework those defects. Long production runs of other color units would force the producer to either break into the middle of another unit’s production run, or double the batch of the blue units on the next run. Either way, this drives up cost or waiting time for me as the customer. Now, in the heijunka model, the company has a lot more flexibility in inserting a single blue unit into the production run. Placing a single blue unit into the production run, or running a batch of two blue units, is far less disruptive in this scenario than it would have been in the first. We know that inventory ties up cash and too much can cripple a company. In our original model this could be the case. Because, at any given moment, the production sequence could shift and we could find that the entire batch is defective. We need to keep at least an entire batch’s worth of raw material on hand. Now, the same assumptions hold true for the heijunka model. But because the batch sizes are so small, one piece in this case, we can hold far less on inventory on hand than if we didn’t have the level production run. This same scenario applies to finished goods inventory. The customer in our original state has learned that he needs to hoard product when it is available because lead times are so long. This means, as a producer, we need to hold a lot of finished goods because we have inadvertently trained our customers to behave this way. Now, if we demonstrate to our customers over time that we can produce what is needed, when it is needed, quickly and in small batches, the customer will learn that hoarding is unnecessary. This allows us to decrease finished goods inventory and free up cash. Companies that successfully implement lean have a good grasp on static and dynamic scheduling. A dynamic model is purely reactive. In our factory we’re very confident that customers order five of each color unit during any given month. We could, in theory, run five of each color in a row every month and this would satisfy customer demand. But instead, our dynamic scheduling model functions like a giant black box. Orders go in and the black box tells us what to run next. As a result, there is little predictability as to how long it will take to begin production on these green units. All we can tell you is that, on average, it will take 15 days before the first green unit will begin in production. Now, notice the static loop we have on the bottom. Having the discipline to establish a static loop is what opens the gate for heijunka. As a quick note, when I say static, I don’t mean you won’t have the leeway to make adjustments. 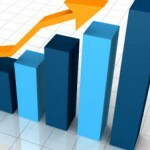 You’ll need to adjust slightly over time to produce the changes in customer demand. the foresight to create a static schedule is the first step to making heijunka work. Now let’s take it to the next level. We apply set up reduction so you could reduce batch sizes to lots of one piece. Now, in this static model, you can see if someone just consumed their last green unit, they’ll need to wait exactly four days before another green unit will pop off the end of the line. Notice we’re running in four day static loops in this scenario as opposed to twenty day static loops in the original static loop without heijunka. Either case is much more advantageous to the dynamic black box you saw previously. Finally, notice that 20 days if the absolute max lead time for any batch of any color in this static loop. In the dynamic model there is theoretically no max lead time. This means your order may never make it through the production system. The final and most important advantage to leveling is shortening order-to-cash. In our original model, we have to wait until the end of the entire production run of blue units to get paid for them all at once. But in the second scenario, we can get paid faster and in smaller increments. Now, this may not seem like a big deal, but imagine if your company decided to start paying your salary once a year. Would you be fine with that? Obviously, we’ve grown accustomed to getting paid weekly or bi-weekly in small increments of our annual salary. Using that same logic, we need to find creative ways to get our company paid faster and in smaller increments. So again, traditionally, we like to run large batches. We like low variation. Again, people like villainize Ford by saying, “You can have any color, as long as it’s black.” Then we want to minimize the number of set-ups in a traditional run, and we always want to run the largest batches first in a mixed-model system. To batch would be something like this. You visit a doctor and he tells you that you need your tonsils out. The doctor tells you setting up the operating room is very expensive, so you need to come back in the third week of next month because that’s when he does all of his tonsil cases at once. Minimizing total set-ups would be something like this. The same scenario with the doctor but it’s expensive to set-up so he tells you to come back when you need your appendix taken out, you have a broken arm, and he gives you a good look and says, “You might want to think about that liposuction too.” This way I can take care of everything at once, and set up the operating room once. Is this how you want to be treated as a patient? Do you realize this is often how we treat clients when we push orders around and batch them in the name of efficiency? So this is the traditional approach to running production. Notice we’re running four types of product: blue, yellow, red, and green. And we’re producing all four types over four weeks. Traditionally, managers thought that running the largest orders first was more efficient. So the blue units are run first in this model. Now, take a look at the little truck at the bottom of the board. This truck takes one type of each unit to the client. Notice that the truck has to wait until the end of the fourth week before it can complete an order and take it to the customer. So to compute our heijunka ratio, we take the four types, divide it by four weeks, and this gives us a ratio of 1.0. So heijunka, or leveling, is measured in the form of E.P.E.X., which stands for “every part every ‘x'”. So you have every part every month, every part every three weeks, every part every week. It’s best to run every part as frequently as possible. So in your mixed-model system, obviously running it every week is better than running it every month. Who knows? Maybe you can break this down and run every part every day. 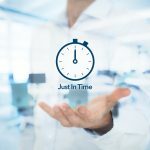 The more you can reduce set-up time and reduce batches; this number actually gets smaller, which improves your E.P.E.X. number. Now, in a lean environment, we like to run in small batches. Lean environments also thrive under high product variation. We try to maximize the number of set-ups, not minimize. And we like to level mixed products. Smaller batches actually run first, rather than last. Remember, running the smallest batches first gets us paid faster. So we’re still running the same four types of units, but we’re running the green units first because there are only seven in total to produce. Now, take a look at the truck at the bottom of the board. It has all four types loaded by the third week of production. So our heijunka ration is four divided by three, or 1.33. This is a 33% gain over the original run, just by sequencing production from smallest to largest. So now let’s get into a real heijunka calculation. We know the monthly demand for each product. Each month the customer wants 20 blues, 9 yellows, 8 reds, and 7 greens. I divide these by four to get a weekly demand. Obviously, I can’t produce in fractions of units, so I round to the nearest whole number. Then I multiply by four again to get a rounded month of what I need to produce. Now I have to check my math to make sure I’m not producing too much or too little of one product. I check my rounded month versus my original monthly demand. I see that blue and red work out perfectly, but I’m producing one too few yellow, and one too many green, if I went with the rounded month. So I finally make this adjustment during the last week of production. So during the last week of the month, I’ll make one more yellow and one less green than I would in a normal week. The math rarely works out perfectly, so keep in mind that you have to have an adjustment period just like this. So let’s apply our math to the production sequence. We’re still running the smallest batch size first. We chose to run red before green because the difference between the two is negligible. Notice the truck fills up with all four types of units within one week. We divide four types by one week and get a heijunka ratio of 4.0. That’s a 200% gain from the second run and a 400% gain from the original. So this is a very basic heijunka board. First thing you probably notice is there are four different colors: red, green, yellow, and blue. These represent the four different color points we built during the simulation. You probably also noticed there are four different columns: week one, week two, week three, and week four of production. So this board right now represents a full month’s worth of production. Now, it works really simple. What I do is pull the withdrawal kanban, and send it into the system. This triggers a red plane to be built. Now, the next thing that we built, again, is another red plane. Send it into this system, it would come out. Followed by a green plane, and so on, and so forth, for week one. So you can see that all these are pretty evenly sequenced right now so we don’t have too much of one being produced at once. In theory, I could sequence this all over so all the blues are built at once, all the yellows, then all the greens, then all the reds. But obviously, we want to balance and level-load what’s being produced every week. So this is why they call this the “central nervous system” of our lean environment, because this literally controls the pulling, the pacing, and the sequencing for the entire shop floor. Next I want to relate value and batch. Now, this is kind of tough for people to swallow and people get upset at this. But, I contend, that only the first piece in any batch is value-add. Now, if you don’t believe me, let’s take for a moment if you consider the entire batch value-add. We would make a bigger batch, and that’s actually opposite of what we’re trying to do. We’re actually trying to minimize batch sizes. value-added time. Yes, this means only a fraction of a second may be value-add for a lead time that takes months. So here are the major steps. First we need to understand demand. And don’t just skim over this. Often times, if you study the data that the customer is actually giving you, you can find that they’re a lot more predictable than you think they are. Then we need to reduce set-up time using SMED. Reduce batch size. Now remember, these two always go coupled. Don’t just do set-up reduction. You have to reduce batch size to correspond to set-up reduction, or else it’s pointless. Reduce inventory down the line, and upstream. And then shorten the pay cycle. Remember, that’s what this all boils down to. Is owner’s diagram of order-to-cash, we have to compress that. Finally, rinse and repeat. Do this over and over again. So, Shigeo Shingo is the pioneer behind single-minute exchange of dies, or SMED. Now, I love SMED because once you combine SMED with batch size reduction, that’s when lean thinking really starts to take shape. He started out in 1950 in a Mazda plant, and they were producing three-wheeled vehicles on three very large presses. He approached the plant manager and asked if he could work on set-up reduction. This is where he developed the concepts of internal and external work. The plant manager wasn’t thrilled about this, but he went ahead and let it go. And seven years later, in 1957, he continued this work at Mitsubishi Heavy Industries. And then, in 1969, he took it over to Toyota, where we see it today. Single-minute exchange of dies refers to the ability to change over a machine that is running good product, to running good product of a different type, in nine minutes or less. Single-minute refers to nine minutes being a single digit of time. You’re probably already familiar with the pit stop example. During a race, a car stops at a pit stop for refueling and a change of tires. The crew works to minimize this time. But how about an example that’s more time-critical? The U.S. military knows that seconds can be the difference between life and death on the battlefield. According to tactical.com, 50-70% of all combat injuries are extremity wounds. 60% of preventable combat deaths are from extremity bleeding. Now, tourniquets have been used on the battlefield for centuries to minimize the bleeding by constricting the area that has been injured. The issue is, during high-stress situations – such as combat – finding a tourniquet often takes more time than is available. To mitigate this, the military now has built-in tourniquets in critical areas on the uniform. So there’s no need to search for a tourniquet. A soldier can now immediately help an injured comrade. Obviously, we’re not dealing with a life-and-death situation in a factory environment. But, in order to reach a single-minute exchange of die level, you and your team have to come up with innovative ways to save precious seconds, just like these built-in tourniquets do. So this is generally how set-up breaks down. You generally spend 5% of your time removing the old tooling, 15% of your time installing the new tooling, 30% of time preparing the new material and jigs, and 50% of your time trialing and processing. Obviously, trialing and processing is the largest time bucket. So here’s a quick demo on how to reduce a large time bucket. So this etch-a-sketch is a simple machine that I use to introduce the concept of trialing and processing. Oftentimes, operators rely on their senses to adjust machinery. Some operators are excellent at doing this and repeatedly dial-in a machine to exact specs with little to no problems. Other operators struggle and this causes wasted time, wasted material, and frustration. So with this etch-a-sketch, I demonstrate that if you understand the knobs and how they affect the machine’s output – the screen – you can replicate any drawing with far reduced trialing and processing time. I’ve taken the liberty of marking each knob with a red line. This serves as a reference point for me. I then calibrate the left knob. It turns out that one complete turn clockwise makes a line traveling right that is 3.4 centimeters long. I turn the right knob 360 degrees, and this makes a line that travels up. This line also measure 3.4 centimeters long. I then reset the machine and turned the left knob 180 degrees clockwise. This is to measure linearity. I expect the outcome to be a line traveling right that is 1.7 centimeters long. I measure and this is correct. I do the same for the right knob and get the expected result. So I reset the machine and do the same thing for both knobs, this time going counter-clockwise. I get all the expected mirror-image results. Now that I know how the machine behaves, and the knobs have been quantified, I can replicate any image with a reduced time in trialing and processing. art that was known as “trialing and processing”. It also decreases the training time needed on any machine. So this is an illustration of the lean continuum. Now, it’s been my experience that all companies start out doing the obvious things, like 5S, and T.P.M., and value stream mapping. They also all do SMED. Now, some companies notice that with the 5S, and the T.P.M., and the SMED that they’ve done, they’ve had limited financial gain. I consider SMED to be the critical fork in the road that separates the men from the boys in the world of lean. Companies that see SMED as a final destination and never couple it with batch size reduction and heijunka, never grow up. They inevitably veer off the lean path and wonder why it never worked for them. SMED is nothing more than a methodology that enables you to reduce batch sizes and balance your production load. Again, if you have no intention of coupling SMED with batch size reduction, you should seriously consider your lean journey. I mentioned that some consider SMED as a methodology to reduce lead time. This is absolutely false. The black bars represent set-up time between batches. Let’s assume the lead time is 20 days and each black bar represents 60 minutes of set-up. 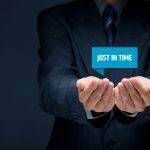 Let’s say work like crazy on SMED and you reduce your set-up times from 60 minutes down to 6 minutes. The result is, you only reduce your lead time of 20 days by 3 hours. Now do you see why SMED alone has almost no impact on lead time? Now imagine you reduce your batch size and level-load your production with your new six minute set-ups. You reduce your 20 day lead time by 16 days. Your new lead time is now only four days. So back to Shingo’s definition of internal external work. Internal work is work that has to be done while the machine is off. External work are actions you can take while the machine is still running. So in washing dishes, an example of internal work is loading and unloading dishes. You can’t do this while the machine is running. But, while the machine is running, you can pre-soak the next set of dishes to be washed. This is an example of external work. Here are the major steps to SMED as defined by Shingo. First of all, all of your tasks for both internal and external will be mixed throughout your productions procedure. You should then clearly separate those that are internal and external tasks. Then convert as much internal work into external work, then reduce all remaining activities. You finally want to standardize. When evaluating a set-up, I always watch the person and take detailed notes. Those tasks that are obviously not adding value with respect to set-up, I segregate and eliminate immediately. This way, I start with a clean state when using Shingo’s five steps. So again, the first step is to recognize that internal and external activities are mixed. Don’t just skim over this step, because it is important for your operators to realize that there is a lot of opportunity, even if this is your second or third wave of SMED. Classroom exercises, examples from other companies, and free, high-quality SMED videos found online help in getting the ball rolling. Next is to clearly separate those items that are internal and external. It’s important to challenge every single step. As a facilitator, you need to ask, “Does the machine really need to be off for this step?” You may be surprised as to how many steps can actually go into the external bucket of activities. You then want to convert internal work into external work. You can often purchase cheap alternatives to allow you to perform work externally. For example, this die-cast company. Prior to SMED, they had to wait two hours for the dies to heat up when performing a set-up. Then an operator suggested that the dies be heated externally. This raised some eyebrows, but a quick trip to Sears and few hundred dollars later, the dies were being heated externally in this cheap, home oven. And the company was indeed saving two hours per set-up on this multi-million dollar machine. So there’s still opportunity to make improvements. I’m big on quantifying knobs on your machines. Operators often have a great feel for what knobs do, but they rarely truly know how the machine behaves. That’s why it’s important to study your machine and understand what the knobs do, just like this etch-a-sketch. Also, you encourage your operators to make adjustments while the machine is off. Needlessly running while making adjustments is like letting the water run while you brush your teeth. Although the primary metric is time savings, material savings is also very helpful. This is perhaps the hardest part of any lean effort. Everybody always wants to revert to their old way. Make sure you carefully capture the standard sequence for set-up and monitor operators as they work through the new routine. Growing up in Florida, I loved being on the water, and fishing is one of my favorite pastimes. Believe it or not, fishing is a lot more science than art. On one fishing trip, we were catching far more tarpon than any other boat out there. One boat later approached us and asked how we were so quickly able to zero-in on the depth, tackle, and the bait to use. I showed them my standardized sheets that allowed us to reduce the time of trial and error to allow us to pinpoint fish in less time. I explained that starting out with a large standard array of options, then eliminating those choices that are not working in a standard manner, helps us catch fish faster. He was not impressed. So in this demonstration, we’re reducing the set-up time of the gas pump. When performing SMED, I always have a copy of the tasks that are being performed. I record the actions. I have a spaghetti and a meatball chart, and of course, a timer. I also use a pedometer to capture the number of steps I take. This gives me two solid metrics to improve. You can pick up a cheap pedometer for about $10. Now, walking may seem trivial to you, but I’ve measured operators literally walking two miles during a set-up. Remember, set-up time is the elapsed time between good part to good part. In the example you see here, it’s the time that elapses between the last green square and the first red triangle. In our example, it’s the time that elapsed between the last drop of gas that goes into the car in front of me, and the first drop of gas that goes into my car. So the clock starts the moment he stops pumping gas. As a quick side note, 30 seconds elapse before he pulls away and my car is in position. I start by paying for my gas. We have a lot of love bugs in Florida, so I always start by washing my windshields, both front and back. Now, I personally always start by washing my windshields because I find that I always forget when I pump gas first, and I don’t feel like getting back out of the car to do this. You can see that the sponge doesn’t hold much water, so I have to keep walking back and forth to the bucket. I come back and open my gas cap and begin filling my tank. Now, by definition, the moment I start pumping gas, the set-up time is over. But let’s continue with this exercise to see the total elapsed time. This takes a minute or so, but after I’m done, I replace the pump and close the gas cap on my car. A total of five minutes and thirty-six seconds elapses from the moment the previous guy stops pumping gas, to the second that I’m ready to pull away. My pedometer shows me that I took a total of 88 steps. So let’s follow Shingo’s five steps to reducing set-up time. So this is step one. Obviously, internal and external tasks are mixed. I recognize this and I’m ready to improve. So, step two. Can I pay for gas while the pump is running? Sure I can. While the guy in front of me is pumping gas, I can go pay in advance, so this is an external task. We have to go through a number of steps to wash the windshield. Again, does the gas pump have to be off in order for me to wash the windshield? Yes, because I can’t hold the gas handle and wash the windows at the same time. So all the tasks associated with washing the windshields have to happen while the gas pump is off. So by definition, these are internal tasks. So how about opening the gas cap? I can do this while the previous guy is pumping gas when I go to pay for my fuel. So this is task is also externalized. Next, pumping gas is by definition an internal task because the machine is running. Now, how about closing the cap when I’m done? Well, I can’t do that while the previous guy is pumping gas, nor can I do it while I’m pumping gas. But, I can pull away and do it while the guy after me is pumping gas. So I can externalize this task and do it after I free up the gas pump. I definitely don’t want to get back in the car while the gas is pumping, so this remains an internal task. The next step is for me to convert as much internal work to external work as possible. So I notice there is a little tab on the handle of my gas pump. This frees me up to wash the windshields while I’m pumping gas. Remember from our history lesson that the Toyota family created a loom that would automatically stop when a thread broke. This freed up workers to perform other tasks while the machine was running. This handle works the same way. It stops once it detects that the gas tank is full. So I can safely externalize all the tasks associated with washing my windshields. What if I invested $2 and bought a spray bottle, and filled it up with soapy water? I wouldn’t have to walk back and forth to the bucket anymore, saving me many steps. It would also get my windshields cleaner, because I wouldn’t be dipping the sponge back into that filthy water. So armed with my new sequence, I give my new, improved state a go. Having a set, standard sequence is the last step. I carefully study my sequence and begin. First, I go pay and open my gas cap while the previous guy is pumping gas. Like in the original scenario, 30 seconds elapses before I pull in and I’m ready to go. Because my gas is paid for and the gas cap is open, I can begin fueling right away. I use the tab on the handle. Now I can go wash the windshields while the machine is running. I already have my spray bottle out, and I walk over to the wash bucket to get the wiper. I wash the windows with the exact same level of care as I did in the first scenario. Eventually, the gas handle clicks, indicating that refueling is complete. I return the wiper to the wash bucket and I put the gas pump away. I refrain from closing the gas cap until I pull away because this is an external task. I pull away, and then close the gas cap. We completed all of our tasks in a minute and fifty-nine seconds in this run. This is a 64% reduction from the original five minutes and thirty-six seconds. My pedometer says I took 22 steps this time compared to 88 steps originally. This is a 75% reduction in steps. I think the $2 spent on a spray bottle will pay for itself in no time. Now, this little exercise doesn’t do a full SMED-kaizen event justice, but hopefully it opens your eyes to opportunity that you may not have seen before. So here’s a quick review of what we’ve learned. We reviewed mura and we learned that heijunka can be used to combat mura. We learned about production leveling and product leveling. We learned about single minute exchange of dies and how this links to batch size reduction and leveling. Great stuff. Very interesting when you are currently working with projects. Hi, Just a quick question. Will it defect purpose of Heijunka application supposing customer requests Product A to be delivered on Wednesday for given example above? And what about set up time? Heijunka must come with short set up time? We need to keep inventory for levelling purpose right? What is your suggestion to keep inventory level?